Alliance Wake: What was it like growing up in Mammoth Lakes, CA? 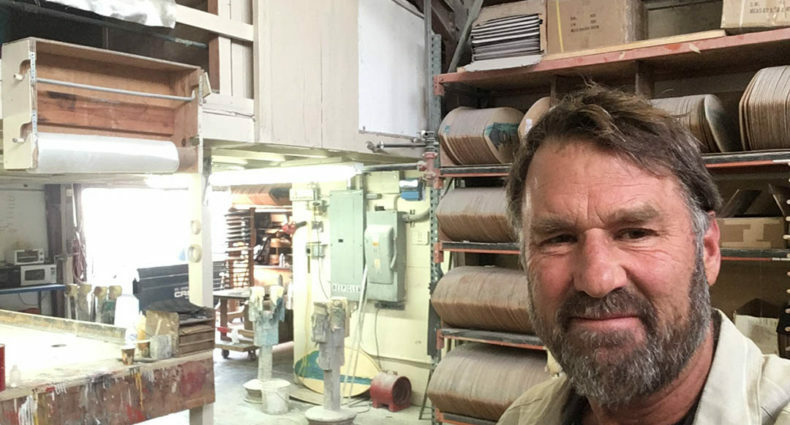 Tommy Czeschin: Growing up in Mammoth was amazing, as a kid in the winter we would take a mandatory day off from school once a week to hit the mountain for P.E. Summer time would consist of hiking, fishing, swimming, BMX, and boating. AW: When did you start snowboarding and how did you get into it? TC: I grew up skiing from age 3 then started snowboarding at 11. Snowboarding was a new sport in the area at that time. I could not get enough of it. I joined the Mammoth Snowboard Team. By 15 I qualified for the US Snowboard Team. TC: I started riding pro at 15, won World Cups, Grand Prix tours, Triple Crown events, Metaled in Gravity Games, X Games, US Open, Goodwill Games, and made the 2002 Olympic team for Snowboard Halfpipe. The Olympics was the highlight, the US only takes four men on the team, so you truly have to be one of the best in the world. I got 6th place. Once an Olympian always an Olympian, though. I was also able to run The Amazing Race in season 19 as “the snowboarders” with my friend Andy Finch. AW: How did you get into wakesurfing? TC: I love surfing; surfing in the ocean, surfing in rivers, surfing behind boats, surfing the snow, surfing the streets. Loving surfing and living in the mountains we would surf behind boats. When I got a boat that we could actually wakesurf and drop the rope – that was it. I love wakesurfing. It is something that you could do forever and it never gets old. 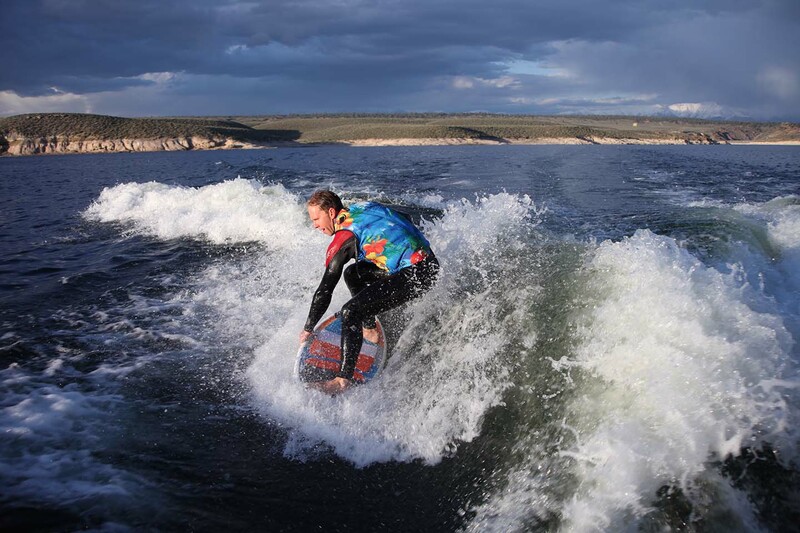 AW: What’s it like being involved in wakesurfing professionally vs snowboarding? TC: Both have been awesome, but totally different. 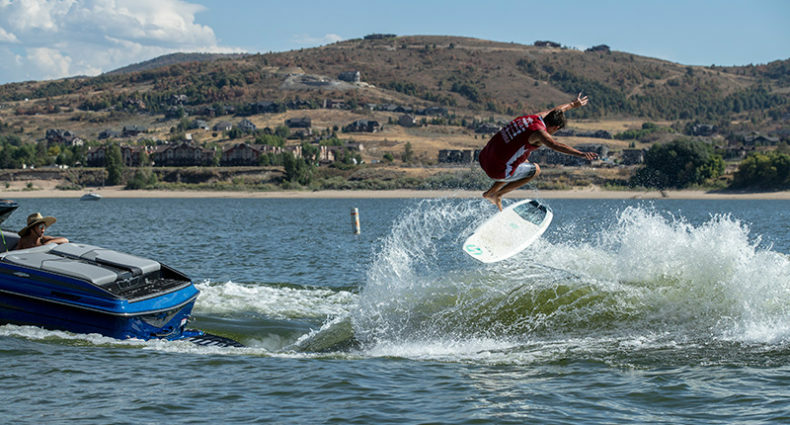 The contest side of wakesurfing has a ways to go, but is evolving. I don’t love the format that is used in wakesurf comps with all the different categories: skim, surf, etc. 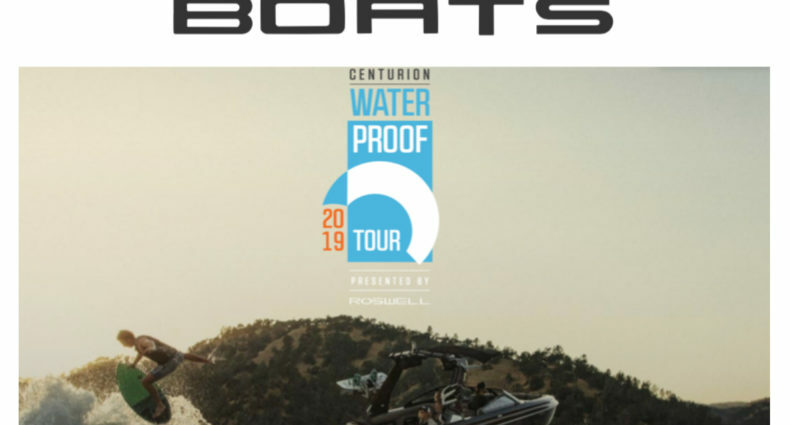 I think it should be a wakesurf contest and people should ride what they want, what they think they can perform best on. This would save a lot of time, the purse could be doubled, and more entries spots could be opened up. I like the LF pro rider judged event that just went down in Minnesota. The riders were hanging out on the boat together, which made it feel more like a session than a contest. I also love the design and development side of things. I had a pro model snowboard for seven years and was able to give input on build design and now in wakesurfing too. Speaking of design, how did you get connected with Liquid Force and what’s the story with your pro model shape? TC: Through a mutual friend I met the LF guys. At the time I was doing a small wakesurf company when LF offered me the opportunity to ride for them and design a board. I started working with Jimmy on ideas and shapes in 2009. We did some proto boards until I found the one, the TC skim. This board has been a crowd pleaser and everyone’s favorite board on the boat for five years running. My new board with Liquid Force, the Primo, is based off of the TC skim. It is kind of a mix as far as skim and surf; I think it’s the best of both worlds and very durable. It has fin boxes that allow it to be set up as a single tracking fin or a twin with 4-inch fins. The board has a bit going on: it is a double winglet and has a single concave into four jets coming out the tail for traction and speed. It is definitely a crowd favorite; beginner to advanced. 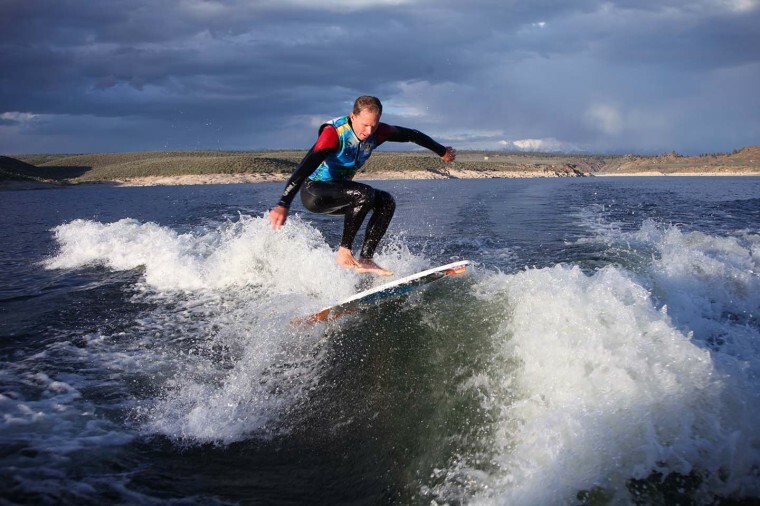 AW: What is it like being a wakesurfer in a mountain town? 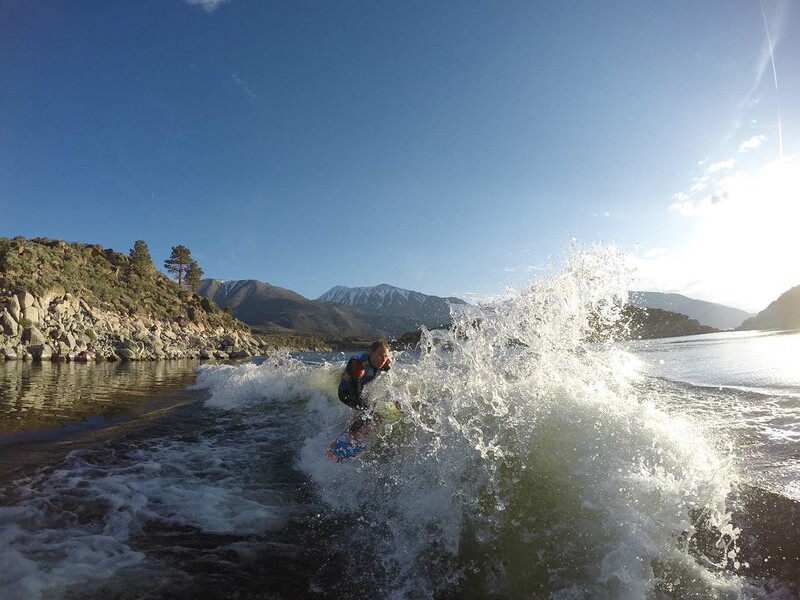 TC: It’s nice having four seasons, however it would be nice to have a bit longer to wakesurf. We start the season with wetsuits in April then mid summer the water gets to be mid 70’s. We finish off the season with wetsuits in October. By this time you start to look forward to the cold months and getting the winter shred on. AW: What lakes do you usually ride around Mammoth? TC: The lakes around here are amazingly beautiful and uncrowded. Just give the fishermen their distance in the early AM… Actually the fishing is so good the firshermen are always pretty happy. AW: How often are you taking snowboard buddies out to wakesurf and what’s their impression? TC: We have a fun Crowley crew here, it’s great. Everyone loves wakesurfing once they try it. The snowboarders I take out usually get the hang of it pretty quick and love it. I’ve had most of our US Snowboard athletes out from time to time. 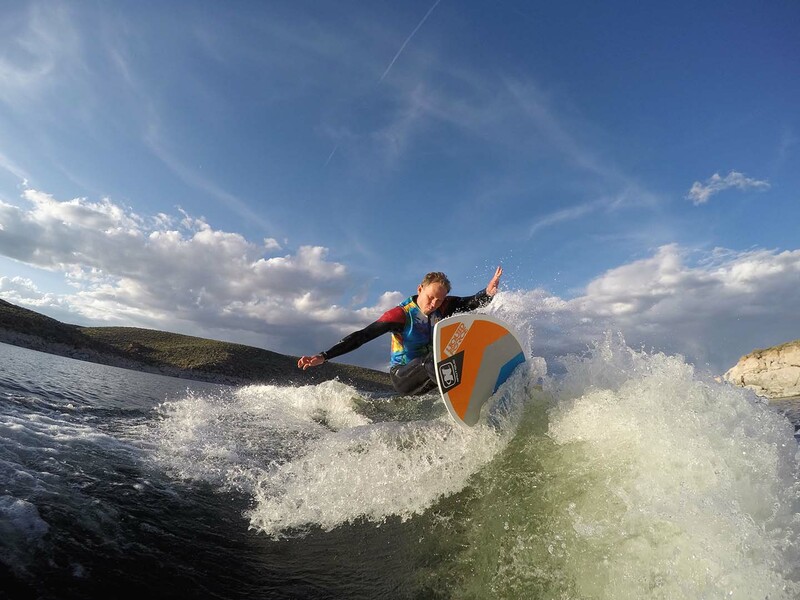 AW: What’s it about wakesurfing and teaching others that gets you so stoked? 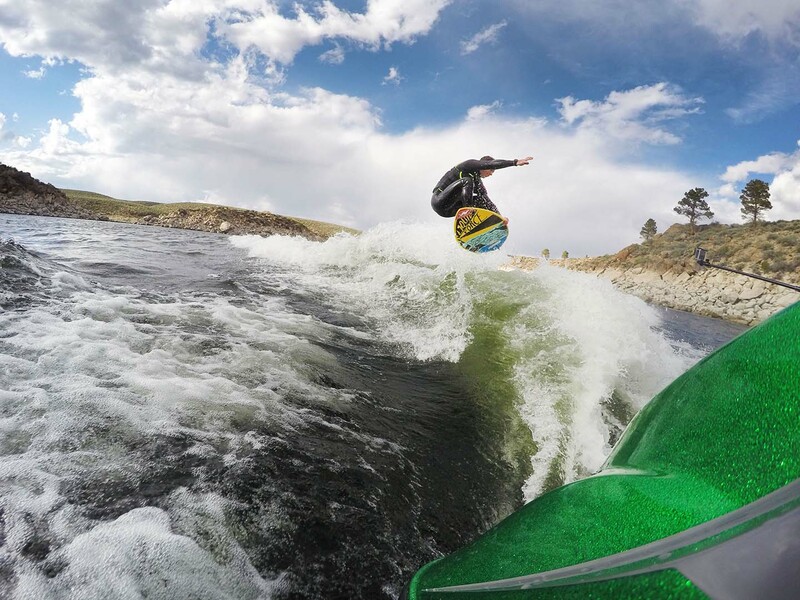 TC: Wakesurfing is the easiest surfing anyone will ever do. It is very friendly, no impact, slow speed, not strapped into the board and no sharks in the freshwater lakes. I think wakesurfing is almost like golf or fly fishing; it is something you could do forever and it never gets old. It’s fun teaching people how to wakesurf; seeing their face when they get surfing and are able to drop the rope.